Did you fall in love with one of the ballroom dances you saw on Dancing with the Stars? Does music just make you want to move? Do you have an upcoming special event or wedding? Ballroom dancing is for everyone! Shall We Dance Studios Louisville offers a welcoming, fun, and comfortable learning environment. Through ballroom dance lessons, our students have reported weight loss, increased self confidence, meeting new people and making new friends, a sense of achievement or accomplishment, a release from tensions, and more fun and enjoyment out of life. How are our students taught? Drawing from over 24 years of teaching experience, the Shall We Dance Studio Louisville owner and champion dancer Kimberly, has developed a proven 3 part system of learning. We have taught literally thousands of new dancers just like you to become comfortable, confident, and accomplished dancers. It's recommended that all new students begin with private dance lessons and later add group dance classes and practice. Independently planned private dance lessons provide each student with the specialized and personalized attention you need to look and feel great dancing. Private dance lessons offer 100% of the attention of your professional dance instructor. Private dance lessons are scheduled by appointment. Dance Classes are also an important addition to private dance lessons. A variety of patterns and the ability to lead or follow any partner will be learned. Group dance classes are lots of fun and provide the student with the opportunity to meet other students at the same dance experience level and with similar dance goals. Practice is the last, but not necessarily the least step in learning to dance. Just knowing the steps is one thing, but making the dances work in a live setting is quite another. That is what our practice dance parties do. Your dance instructor can then custom tailor your private dance lessons based on how they see you progressing. 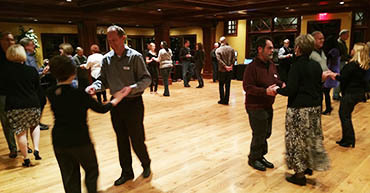 We teach all styles of partner dancing including: Ballroom, Latin, Swing, Salsa, Country Western, and Wedding Dance Lessons. If you have a specific preference, just let your dance instructor know and we would be glad to help! If you're not sure, no problem. We'll just start with the basics of the dances you would likely use the most frequently in order to prepare you to dance in any social situation. 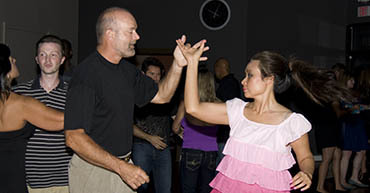 At Shall We Dance Studio Louisville, we teach 24 different styles of partner dance. However, these dances are most commonly requested and most user friendly for social dance situations. Try A FREE Dance Lesson! What's Learning To Dance Like? Are you afraid to dance, but have always wanted to? "I have two left feet." or "I have no rhythm." are the types of things we hear from almost every new students we have ever taught. The professionals at Shall We Dance Studio Louisville make learning to dance fun and easy. So, you're wondering what learning to dance will be like for a two left-footed beginner with no rhythm such as yourself? While all new students are a little different, the process of learning to dance is pretty similar and all new dancers pass through the same stages of learning that we went through when we first started. To give you an idea of what to expect learning to dance to be like, here are the stages of learning you are likely to go through on your way to becoming the comfortable, confident dancer you want to become. INTRODUCTORY STAGE - This is where we all start. An introduction to the basic steps and "How dance works." AWKWARD STAGE - This is the first stage where we are beginning to "try" to dance. While this stage doesn't last very long, it is common that new dancers may step with the wrong foot and make simple mistakes. MECHANICAL STAGE - Now, a new dancers begins to put the pieces together and can take the steps in the right order and put the feet in the right places. It may feel a bit mechanical and requires the new dancer to be consicous of the steps as they are performed. NATURAL STAGE - Each step is perfomed easily and dancers will begin to feel like they are really dancing. Each step is danced easily and comfortably. This is where we begin really moving to music and are much more in sync with our partners. TECHNICAL STAGE - Now we begin to focus on the "polish" of each dance or step. More emphasis is placed on posture, foot placement, arms and the styling aspects of each dance. Our instructors remember what it was like to be a beginner dancer and have taught thousands of people just like you that you CAN dance! We would love to have the opportunity to introduce our wonderful and exciting hobby to you and help you find out what dance can do for you.